Crazie-Talk’s Arun and Peter were on the scene again over at NC Central for the NC Pro-Am Summer league. 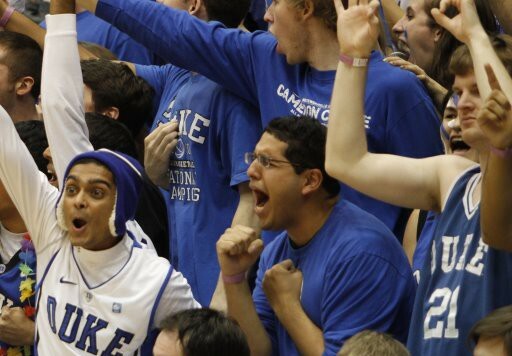 We managed to catch some good action on the court tonight, and the Blue Devils were certainly out in full force. In our first game of the night, Seth Curry was the lone Devil on his squad. Kyrie Irving and Josh Hairston teamed up in the second game of the night, and they did not fail to impress. Kyrie in particular showed a dazzling display of moves both on and off the ball, and as usual, was very comfortable with the ball in his hands. We continue to be amazed by his ability to squeeze through the smallest openings in the lane and finish with either hand or find an open teammate for an easy bucket. His 3 point range was also on display, as you can see from our highlight reel. The third game of the night was a real treat for all the Duke fans in the building. A handful of Duke’s youngest stars, including Ryan Kelly, Tyler Thornton, Andre Dawkins, Mason Plumlee, and Marshall Plumlee all saw action in this game, and all five were occasionally on the court at the same time. Ryan Kelly continued his solid summer season at the NC Pro-Am and showed off his varied offensive repertoire of drives to the basket, shots beyond the arc, and midrange jumpers. In one spectacular move (which we luckily managed to capture), Kelly used multiple crossovers to get around his defender (Marshall Plumlee) and finished with a smooth up and under move. Not to be overshadowed by his fellow freshman point-guard, Tyler Thornton showed Duke fans his deceptive quickness, improved range on his jumpshot, and consistent defense. Andre Dawkins played to his strengths and buried a number of long range jumpers. Mason Plumlee used his athleticism to his advantage by throwing down some thunderous dunks, and he also showed some surprisingly tight handles on multiple unassisted drives to the hoop. Marshall Plumlee, the youngest of the three brothers, teamed up with his older brother to form an imposing frontline for the opposition. Although his game is quite raw at this point, we noticed much of the same athleticism that his older brothers are blessed with. At this point, Marshall seems to be more comfortable closer to the basket in a traditional center role, where he can use his seven foot frame and length to his advantage. We’ll continue to go to the Pro-Am as time permits, but until then, check out our other videos on Crazie-Talk TV, our official YouTube channel.